The poker games glossary at gamerisms is divided into 5 parts: multiplayer poker games defining a dozen versions played at casinos online and off, Holdem Omaha & Stud terms, Poker Software Reviews and a 2-parter listing general poker terms. The game of poker offers many versions and this introduction for poker games glossary describes multiplayer games to include Razz Caribbean Stud, 5 Card Stud, SitNGo, Red Dog and Let It Ride. Other multiplayer card games that are unique, sometimes obscure or games that were fun to play at the kitchen table are in the skill games unit of the site. Rummy and the variants, for example. begins with one of the more familiar multiplayer games, 5-card stud poker. Players’ hands are dealt 1 card down and 1 card up and the highest card up places the first bet. For each betting round thereafter, the player with the best poker hand face up makes the call to bet, fold or check. Three more cards are dealt face up in 3 separate rounds of play followed by a betting round for each to those players remaining in the poker game after each round. Any player who folds must turn all cards face down. Players in the game at the end before final betting will have received 5 cards—4 cards up and 1 card down. Players remaining then reveal their hole card to determine the higher hand and winner. Casino table game based on standard 5-card stud poker game played on a blackjack-type table with 1 deck of cards. Players are dealt 5 cards face down. Dealer receives 4 cards down and 1 up. Players decide to fold and lose their original wager or bet an amount equal to twice the value of the ante. Dealer must have a minimum hand of Ace/King to qualify. If the dealer does not qualify, players will win even money on their ante and push with their bet. If he dealer’s hand qualifies and loses to the player, the ante will pay even money and the bet will pay according to the table’s established payouts. Most casinos offer a progressive jackpot side-bet paid to high-ranking hands like a royal or straight flush. Similar to 7-card stud, this poker game’s exception is that the low hand wins. Three cards are dealt to each player. The first two are down cards and the third is face up for everyone to see. A round of betting follows, as it does after each of the next three up cards are dealt. The seventh and last card is dealt face down. One last round of betting and the players in the game reveal what they have. To determine the low hand winner, flushes and straights do not count as high hands. was once an immensely popular banking game, a variation of its cousin Acey – Deucey. Casinos these days do not usually feature this game, but it can be easily found at online casinos. The game is a simple calculation of difference or spread of the cards, i.e., two cards are drawn from a pack; the spread of these two cards decides how your odds would be calculated. There are several versions of both Red Dog and Acey Deucey. Popular amongst these are the High Card Pool where the money can also be wagered on the suit of the card that turns up next. 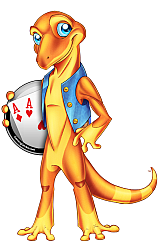 Slippery Sam or Six-Spot Red Dog has players betting without seeing their cards. Shoot is a version in which, only the dealer makes a bet that is an amount which suits all players. The players are dealt three cards each, face down and can only see the cards once they bet. There is a lower and upper limit (which is the pot sum) to the amount one can bet. If the card that you turn up belongs to the same suit as the dealer’s and is a higher valued card, you win. Polish Red Dog varies only slightly from Slippery Sam in that; the players neither see their cards nor the dealer’s card before betting. Based on five-card stud, this popular game had to be included for this poker games glossary. It is played with as many as seven players who participate on what looks like a regulation blackjack table. Rather than beating the dealer as with other poker games, everyone has the same chance for profit. To begin, all players place the same bets in each of the three betting circles before any cards are dealt. A three-card stack is dealt to each participating player facedown in front of their particular betting circle and then two cards dealt in front of the dealer become the community cards. The player makes a decision to Let It Ride or takes back the first bet. If the player proceeds, he/she will be shown one of the two community cards and will make the next decision on a fourth card. If the player decides to move to the fifth card, there is a Big Show of the second community card. Following the Big Show, the dealer reveals all players’ cards and pays according to bets still riding in each betting circle based on an established payout schedule. This popular poker version is played at a table similar to blackjack and the goal is to make the best hand from three cards with no draws or wild cards. 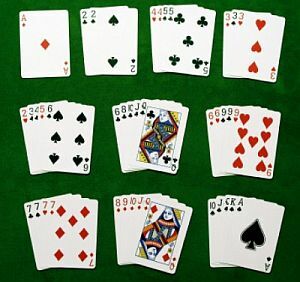 The five possible winning hands are Pair, Flush=any three cards of the same suit, Straight=three cards in consecutive order, regardless of suit=6, 7, 8, Three of a Kind or Straight Flush=three cards in consecutive order, the same suit=8, 9, 10 of clubs. Game rules require that the player set two hands, a high=5 cards and a low=2 cards with the intent of trying to beat the banker’s two hands. The cards are ranked as per standard poker hands, the exception being the one joker that can be played as an ace or the high card to finish a straight, flush, straight flush or royal flush. You must win both hands to win the pot and the house/bank receives a commission on all winning hands. Popular worldwide, this poker version is dealt from a shoe holding 8 decks of cards. The player and the banker are each dealt a hand of two cards. Poker players can bet on either of the two hands to win. Winning means coming closest to a value of nine, and not over. Directly in front of players are two boxes. The box closest to them is for betting that the player will win the next hand, and the box furthest away is for betting that the banker will win. Most casinos have a minimum bet. All number cards, 2 through 9, count as their face value or the number of pips on the card. All 10s and face cards count as 10. Aces count as 1. No hand can be worth more than 9. If it is, the last digit of the total is used. For example, if the hand has a king (10) and a 2, then it totals not 12, but 2. To determine the value of a hand greater than 9, simply use the last digit of the total number, such as 9 for 19, 0 for 20 or 7 for 17. This game is a poker relative of baccarat. With this European game, you cannot bet on banker or player, you must be one or the other, therefore the casino has no direct involvement in the game. The bettors wager amongst themselves. The other departure from baccarat is that there are three banker-player rules where a decision is required to draw or stand. is also known as Sit and Go or Sit ‘n Go, is a single table tournament that will have you competing both online and off with as many as 9 other players. Playing in a Sit & Go tournament is much like playing the final table in any of the regular tournaments, except you will only have to beat 6 or perhaps 7 people to be in the money. That’s what makes these tournaments so exciting. The tournaments are fast paced. The game got its name because as soon as you have registered for the tournament, you are taken directly to your table. The great thing about these tournaments is that they are running continuously and there is usually several tournaments running online and at land-based casino poker rooms at any given time. a Badugi is a hand made up of four cards, where a player has three chances to draw or change the combination, to get the lowest hand possible and win the pot. The best possible hand is A234 of four different suits. The worst possible hand is four Kings. Additionally, Badugi Poker is a draw game where players can swap cards from the deck. The drawing of cards is completed in between the rounds of betting. Therefore, any four-card Badugi hand beats a 3-card; a three-card hand beats a 2-card hand, and a two-card hand beats a 1-card Badugi hand. Two hands with the same number of cards are analyzed by comparing the highest card in each hand considering that ace has a low value and the lower card is superior. With a tie, the second highest card determines the win. Otherwise, if the ranks of all the cards are the same, the two hands tie. Simply put, poker bonuses are promotions offered by poker sites to new or existing players. These rewards can come in a number of forms, with the Welcome Bonus being most common and the No Deposit bonus the most popular one. Welcome bonuses award new players who sign up and deposit real money on their accounts. No Deposit bonuses, as their name suggests, are ones that deal out increments of money or tournament tokens to new players who just sign up for real money accounts. Includes Holdem Poker Report that details the best and worst starting hands.